Banana Flip recipe by Sara at DesiRecipes.com. 6 bananas (peeled and thinely sliced). Take a bowl and add the cream in it and beat it until soft peaks form for about 10 mins, gradually adding the sugar in it. 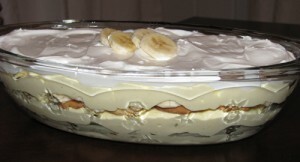 Then take a medium size dish and layer the bottom of the dish with sliced bananas. Then sprinkle some of the candi biscuits mixture on the bananas, follow that by a light coating of condensed milk. At last cover this mixture with cream and repeat this layering two times more.